Not so long ago, New York City had three baseball teams: The Dodgers, the Giants and the Yankees. Competition was fierce and team alliances were set in stone. But then, in the course of one year, only one remained: the others left town. The end result is well known—in 1957, the Brooklyn Dodgers decamped to Los Angeles, becoming the Los Angeles Dodgers, a team now in the World Series. The Giants also skulked away to San Francisco but without much hand wringing from fans or sports columnists or impassioned correspondence to the Mayor. 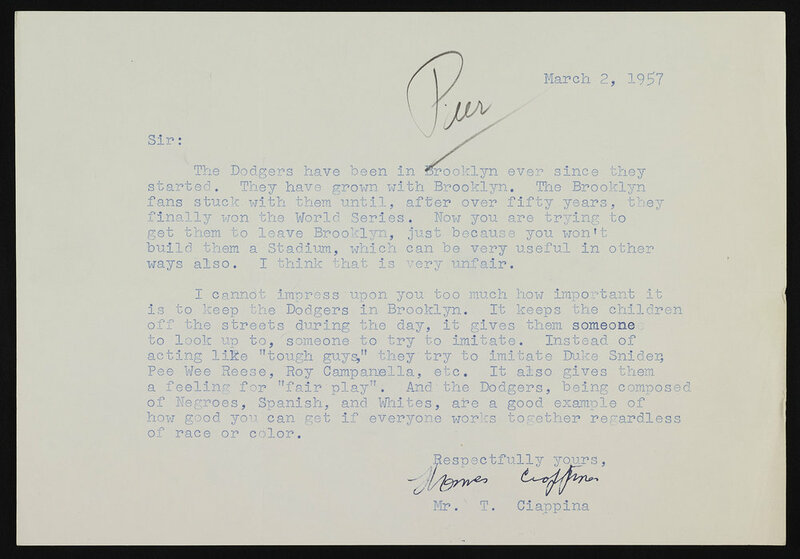 Letterhead from the Brooklyn Dodgers. Mayor Wagner Collection, NYC Municipal Archives. Fingers have been pointed. Names have been called. Bitter jokes made. That got us to wondering whether the Municipal Archives collection of records from the administration of Mayor Robert Wagner might contain any interesting documentation. 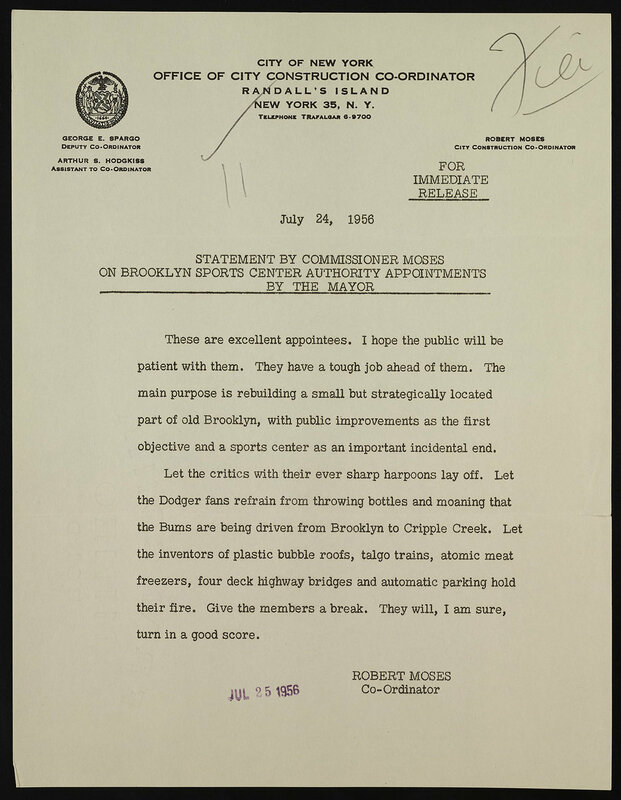 And indeed it did—boxes of correspondence from bigwigs like Robert Moses and from regular fans of “Dem Bums” the loving nickname for the team. There are postcards, multiple petitions, telegrams, typed missives and hand scrawled letters. This constituent correspondence makes up the bulk of the files but interspersed are related materials from government agencies. At least 40% of the constituent correspondence came from women. Perhaps that’s because The Dodgers gave women free admittance at Saturday home games in 1956 and 1957? 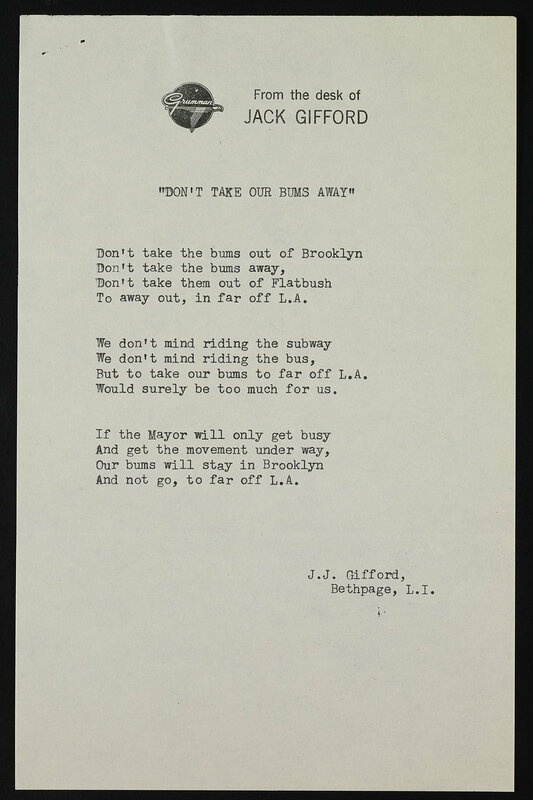 Most writers supported the Dodgers remaining in Brooklyn but some did not. The Mayor’s correspondence includes copies of letters sent to and from Robert Moses and his vice chair, George V. McLaughlin. These merit a separate review to trace the machinations that led to the loss of the Dodgers and eventual launch of the Mets. Lots of people know the Brooklyn Dodgers as the team that integrated baseball by hiring the legendary Jackie Robinson in 1945 to the eternal credit of general manager Branch Rickey. That was not a one shot deal. The team went on, in 1954, to field baseball’s first majority black lineup in a game against Milwaukee. But, for fans of the Dodgers these were a few great episodes in a long-running story of the upstart team. The 1940s and 50s’ teams had a great run—the second most wins of any baseball team, seven-time pennant winners, starting in 1941, World Series champions in 1955 and legendary players. Their stadium, in contrast, was in disrepair. Design blueprint for a stadium for the “Brooklyn Baseball Club, Charles H. Ebbets, Pres.” Clarence R. Van Buskirk, Architect, ca. 1912. NYC Municipal Archives. Ebbets Field, the home of the Dodgers, opened with an exhibition game against the New York Yankees on April 5, 1913. By 1953, the ballpark was outmoded and owner Walter O’ Malley was searching for an alternative site and larger park. Strapped for cash, the City was reluctant to fund construction of a new stadium. Instead, they created committees and special authorities. Legislation establishing a Sports Center Authority with the power to issue bonds was signed into law in 1956 by Governor W. Averell Harriman, paving the way for a new stadium. The Board of Estimate named a special four-person committee including the Brooklyn Borough President and the Deputy Mayor to examine the proposition of building a stadium at the intersection of Flatbush and Atlantic Avenues. Studies were conducted. Hopes were raised. Behind the scenes, Robert Moses schemed. And the Mayor’s correspondence reflects it all. Statement from Robert Moses on Sports Authority appointments. Mayor Wagner Papers, NYC Municipal Archives. Petition to keep the Dodgers in Brooklyn. Mayor Wagner Papers, NYC Municipal Archives. Postcards for and against the Dodgers. 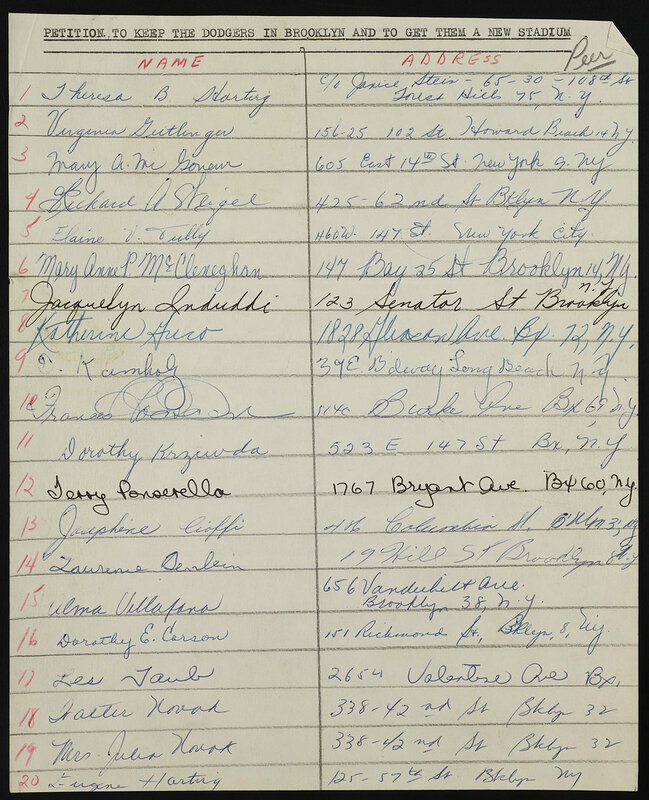 Mayor Wagner Papers, NYC Municipal Archives. The business community was well-represented. Many writers pointed to the revenue at stores, restaurants and hotels generated by sports events and the influx of tourism. Telegram from Bernard Gimbel to Mayor Wagner in support of a new stadium. Mayor Wagner Papers, NYC Municipal Archives. Mayor Wagner Papers, NYC Municipal Archives. The site for the new stadium favored by fans and O’Malley was at the corner of Atlantic and Flatbush Avenues. O’Malley went so far as to offer $6 million dollars for construction and bring on famed architect Norman bel Geddes and futurist Buckminster Fuller who proposed a domed stadium for the site. Proposed site for new stadium designed by Buckminster Fuller. Mayor Wagner Papers, NYC Municipal Archives. Letter with Frank Lloyd Wright’s suggestions for a new stadium on the Upper West Side. Mayor Wagner Papers, NYC Municipal Archives. The Reverend John B. O’Mara, pastor of Our Lady of Solace church proposed locating the ballpark in Coney Island, in a telegram to Moses, opining that the location would get sports fan “out from the congested city” and pointing out that abundant land was available at reasonable cost. 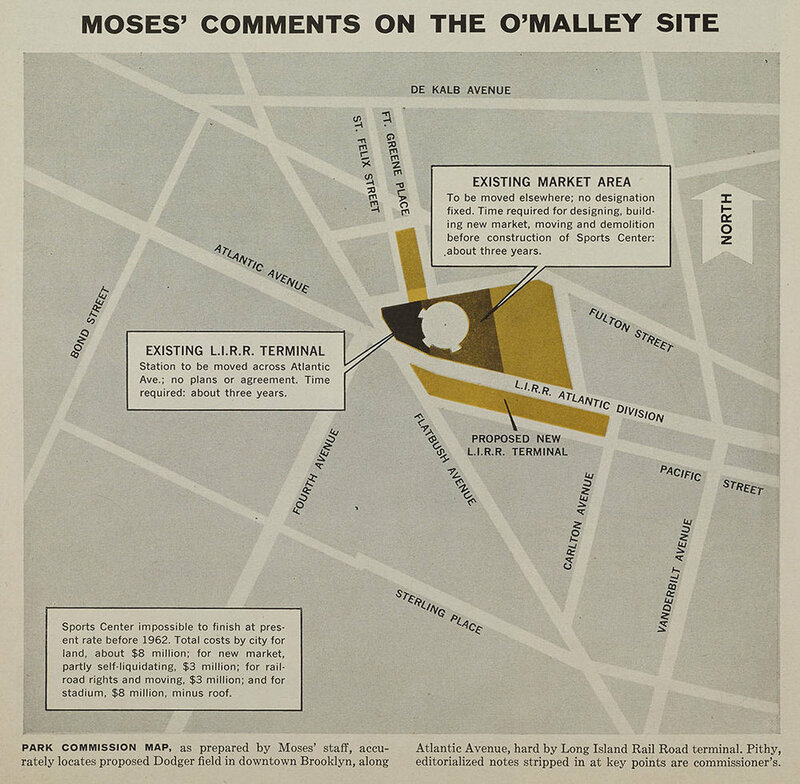 Moses rejected the suggestion, claiming that the Luna Park site was required for housing and doubting the practicality of Coney Island as a location. Another group vying for the stadium was the Fifth Avenue Merchants and Civic Association of Bay Ridge. Touting excellent transportation facilities including access via the subway, the Belt Parkway and other roads, the association promised the site could accommodate 20,000 cars. Additional suggestions included Fort Greene Park, Gerristen Beach, and Staten Island. The alternative proposed by City Council President Abe Stark, however generated a firestorm. He suggested that the Parade Grounds in Prospect Park be converted from the ball fields for youth into the ballpark for professionals. Yowls of displeasure from the coaches, parents and youth ensued. Another proposition was gathered via an intermediary from Frank Lloyd Wright who suggested the Dodgers move to the upper west side. The proposal suggested a roofed, air conditioned stadium that would seat 280,000! However, the Goliath of development, Robert Moses ensconced in Randall’s Island and serving as the City Construction Co-Ordinator, the Commissioner of Parks and the head of the TriBorough Bridge Authority, among other titles, had a different site in mind: Flushing Meadows Park. He wrote a lengthy analysis of the Brooklyn and Queens sites in Sports Illustrated. And he worked feverishly to lure another National League team to the City during the period when he ostensibly was supporting the effort to retain the Dodgers (and Giants). Proposed site of new stadium, published in Sports Illustrated, Mayor Wagner Papers, NYC Municipal Archives. Interestingly enough, three of these locations now house sports teams. The Brooklyn Nets are at Atlantic Avenue, the New York Mets occupy Flushing Meadows and their minor league team, The Brooklyn Cyclones take the field in a beautiful stadium with a magnificent view in Coney Island. There were opponents to a new taxpayer-funded Dodger Stadium, too. Citing high taxes and the escalating price of fuel oil, Walter Lowry of Jackson Heights wrote, “This is no time to subsidize stadium for Brooklyn Dodgers.” A resident on Lafayette Avenue, just up the way from the proposed site questioned,” Is it just that thousands of people should be made homeless so others can have more comfort to enjoy watching their favorite sport?” The president of the New York Central Railroad sent a telegram opposing the approval of a $100,000 study to help find a new site for the Dodgers. And the Taxpayers from the Borough of Queens also opposed the “handout” as did an irate Brooklynite. By 1957, the fans were getting desperate as O’Malley was negotiating with Los Angeles. It was an election year, a fact that they pointed out to the Mayor. In the end, none of it mattered. Los Angeles didn’t dither. They offered to build a stadium for the Dodgers and agreed upon a site. The team played their last game at home in September, 1957, beating the Pittsburg Pirates. In 1958, the legendary bums moved west, winning the World Series again the following year. Home Plate from Ebetts Field, Borough President Brooklyn Collection, NYC Municipal Archives.